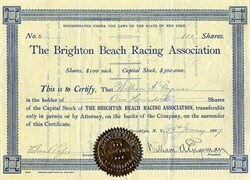 Beautifully engraved RARE certificate from the Brighton Beach Racing Association issued in 1897. 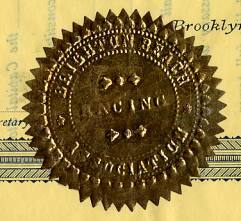 This historic document was printed by the American Banknote Company New Yrok and has an ornate border around it with an embossed gold corporate seal. This item has the signatures of the Company’s President, William A. Engemen and Secretary, Chas. V. Pafs. The certificate was issued to William Engeman and signed by him on the back. The ocean has always been a major attraction for all New Yorker’s and visitors alike. With five miles of beaches, Brighton Beach became a Mecca for the wealthy and ordinary alike. It was especially attractive to William Engeman, an early real estate developer who bought land in 1868 and named it Brighton Beach, after a famous British resort. In 1879, William Engeman formed the Brighton Beach Racing Association which was the home of the Brighton Beach Racetrack. It was a center of thoroughbred horse racing at the turn of the 20th century. It took him six weeks to build his track and grandstand at Brighton Beach. A one-mile race track was built in 1879 for horse racing and dog racing off season. The track was constructed in an area now occupied by Brighton 10th Street, adjoining streets and elevated train line. The race track was converted for auto racing in 1911, but due to numerous racing deaths and laws against gambling, the track was sold, razed and is now mostly private homes. William A. Engeman had made his fortune selling more than a million horses and mules to the government during the Civil War. In additin to building the racetrack, Engema, a year earlier, decided to build the magnificent Brighton Beach Hotel. The town's surveyor, acted as Engeman's purchasing agent, no doubt at a handsome profit, with Engeman's name kept secret until all the lots had been purchased. He also obliged by including some of the town's common lands in his map of what Engeman actually owned, enabling Engeman to secure leases on those lands at trifling sums. Best of all, Engeman was able at a cost of only $20,000, to take possession of several hundred acres of prime ocean-front real estate long before he had actually purchased any part of it. Engeman constructed his Brighton Beach Hotel in time for the 1878 season. This vast wooden hotel, 460 x 210 feet and several stories high, with accommodations for nearly 5000, could also feed 20,000 people per day. He also constructed an Iron Pier nearby and the 400 foot wide, two story Brighton Beach Pavilion. His resort was connected to New York by railroad and was frequented by the upper middle class rather than the wealthy because its location in Brighton was too close to Coney Island's seedier section immediately west of it. With an estimated population of 150,000 people, Brighton is a melting pot of world cultures, which can be seen in its many restaurants, shops and cultural establishments. The largest population thus far are Russians. The first wave came in the early 1900's. The second wave came in the late 1970's with an estimated 25,000 arriving in our shorefront. With this influx, Brighton Beach became a bustling scene of cultural upheaval. Brighton will never be the same. Brighton Beach Avenue is the main commercial strip of Brighton Beach and over 80% of the businesses are Russian owned. The “Momma Pappa” stores of old now reflect the influx of major chain stores like RiteAid and Duane Reed along with Petland Discount. You can not go hungry on Brighton Beach Avenue because there are blocks of produce stores along with restaurants and nightclubs. In the 80's, another 10,000 people from Russia arrived and they still trickle in due to relaxed immigration policies. In addition, large numbers of Koreans, Filipinos, Pakistani, Afghanis, Hispanic and Turkish people have moved into the community. Recently, mosques have opened on and around Neptune Avenue where many middle Easterners are settling. Brighton housing stock is as diversified as its residents. Many elevator buildings are styled in the art deco of the 30's either in their lobbies or their entrances. Building owners have been restoring many of these beautiful lobbies to their former splendor. In many of these buildings you will see the remnant of an extra faucet over the tub which was for salt water. The ocean was literally piped into these homes. Several hundred pre-war boarding houses, which the city calls single room occupancy living, are interspersed in the community. These houses are wood framed and the insides are honey combed with numerous rooms from the basement to the top floors. Tenants share amenities including kitchens and bathrooms. Brighton 4th Street homes such as these served as the back drop for the movie “Brighton Beach Memoirs”, “Streets of Gold” and “Boardwalk” movies also filmed here. To accommodate the influx of visitors, four major hotels were built: in 1873-79 the Ocean Hotel; the Brighton Beach Bathing Pavilion, and Paul Bauer’s West Brighton Hotel in 1876. The Brighton Beach Hotel, the largest of all, was constructed in 1879 and then moved inland in 1888 in a spectacular feat of engineering with more than 120 railroad cars and six locomotives to save it from destruction from the eroding beaches. History from Brighton Beach Neighborhood Association.